Siap+Micros this year will be present at HydrometAFRICA 2019 in Cairo (Egypt), from the 18th to the 22nd of February. This event will be an important showcase where all the major manufacturing companies in the hydro-meteorological field will meet, along with representatives from many African public and private bodies, interested in the field of environmental and water management. HydrometAFRICA represents the most important exposure for the environmental, hydrological and meteorological industry in the African Continent. We are waiting for you at stand 20 where we will show you our most recent projects, products, and where we will discuss potential applications of our systems. The British company Varysian organizes HydrometAfrica in partnership with the Egyptian Meteorological Authority (EMA). For more information, visit the website of HydrometAFRICA 2019. Practically, this acquisition has been completed by Siap+Micros Holding S.r.l., an Italian company created by OSMOS and SANLIEN. To demonstrate their confidence in SIAP+Micros’ strategy and to ensure the continuity of the business for the full satisfaction of both Italian and foreign customers, the new shareholders have decided to maintain the existing organization and management. Therefore, the current President of the Board, M. Renato Maguolo, and the Chief Executive Officer, M. Alex Stevanin, have been confirmed in their respective positions. Siap+Micros has been created in 2003 from the merger of SIAP Bologna (1925) and Micros (1976). With almost 100 years of history and experience in the meteorological sector, the company has gained a worldwide recognition for its cutting-edge expertise in the field of environmental monitoring. It has developed one of the widest available range of state-of-the-art products and systems, totally “Italian made”, including meteorological, hydrological and environmental sensors, as well as data transmission equipment and high value software tools. Since 2003, Siap+Micros was mainly owned by the late Mr. Piergiorgio Vigliani together with his family and several minority shareholders including MM. Giovanni Garnero and Carlo Zumaglini. Under the leadership of MM. Maguolo and Stevanin, the company has consolidated its expertise and accelerated its development in Italy and internationally. The capability of Siap+Micros to bring innovative solutions, offer comprehensive services and develop international partnerships have boosted the expansion of its customer base, both in the public and private sectors. The partnership between Siap+Micros, OSMOS and SANLIEN is a unique combination of differentiated expertise and service portfolios. It will bring to the market a wider and complementary offering of integrated monitoring solutions for the building, infrastructure and industrial sector. Climate and weather conditions impact our daily lives, our societies, our economies, and our infrastructures. Infrastructures are aging and are very much exposed to extreme climatic events, accelerated by climate change, and are increasingly impacted by the consequences of globalization such as heavy traffic. In this context, high-quality monitoring solutions are key to anticipate necessary maintenance and renovation works of infrastructures and guarantee their durable functioning and safety in the long-term. OSMOS and SANLIEN monitor already a wide range of infrastructures around the world and have established themselves as major players in providing integrated monitoring solutions. The full acquisition of SIAP+Micros represents a key milestone in the development of OSMOS and SANLIEN as it will provide them with powerful additional solutions and expertise in meteorological, hydrological and environmental monitoring. Furthermore, both companies will enable SIAP+Micros to leverage their already established networks across the globe to expedite its own development at the international level. OSMOS is a subsidiary of EREN Group, the first group dedicated to the economy of natural resources founded in 2012 by Pâris Mouratoglou and David Corchia. Established in 2006, OSMOS is a recognized specialist in the field of Structural Health Monitoring (SHM). It offers a wide range of solutions in monitoring structural assets of the building, infrastructure and industrial sectors. OSMOS designs and manufactures innovative sensor systems based on a unique optical-fiber technology, the Optical Strand®. This technology allows the monitoring, the detection and the measurement of deformations and potential weaknesses of various types of buildings, infrastructures, and industrial equipment. OSMOS also develops with engineers, mathematicians and data scientists its proprietary algorithms for data analysis and interpretation. OSMOS’ suite of software, SAFE Works®, allow its customers and engineers to visualize, analyze and interpret the deformations of infrastructures. OSMOS latest SAFE Traffic® software development combined with the Optical Strands® sensors provide both structural health monitoring of bridges and overpasses and weigh-in-motion (WIM). OSMOS structural health monitoring solutions have already been implemented with customers of the public and private sectors in more than 20 countries including: France, Italy, Germany, Switzerland, Belgium, The Netherlands, Spain, Canada, USA, Brazil, Chile, Argentina, Turkey, Russia, UAE, Saudi Arabia, Oman, Kuwait, Korea, Taiwan, and Japan. About SAN LIEN Technology Corp.
SANLIEN Technology Corp, established in 1967, has been at the forefront of monitoring buildings and infrastructures in Taiwan through engineering instrumentation. SANLIEN provides safety and accurate measurement of civil engineering projects and works. SANLIEN’S engineering solutions include EEWS (Earthquake Early Warning System), the integration of sensors, industrial automation and graphic equipment as well as pile loading test, geotechnical automatic monitoring systems, structural monitoring, landslide monitoring, weather monitoring systems and other services related to high quality measurements. SANLIEN provides instrumentation and monitoring systems for many important civil construction projects in Taiwan and other countries in Asia such as Korea, Vietnam, Philippines, Thailand, Singapore, Malaysia, Indonesia, India, Australia, New Zealand, as well as Mexico and USA. 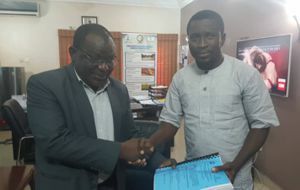 Siap+Micros is pleased to announce the signing of the contract with FEDERAL MINISTRY OF WATER RESOURCES – TRANSFORMING IRRIGATION MANAGEMENT IN NIGERIA (TRIMING) PROJECT. The objective of TRIMING (Transforming Irrigation Management in Nigeria) is to improve access to irrigation and drainage services and to strengthen institutional arrangements for integrated water resources management and agriculture service delivery in selected large-scale public schemes in Northern Nigeria. The purpose of this Contract is the Procurement and Installation of Hydromet Equipment and Provision of Related Services at Sokoto Rima and Hadejia Jama’are River Basins for Hydrometric Improvement under the TRIMING Project. This project will see a total of 87 stations installed monitoring river flow, reservoir level, groundwater levels, surface and groundwater quality, and meteorological parameters. Four reception centres will present the collected data to the interested parties. During 3 years of operations and maintenance by Siap+Micros, the local operators will become fully capable of operating the system well into the future. Our company is confident that this project will be the beginning of a long-term and fruitful cooperation with FEDERAL MINISTRY OF WATER RESOURCES – TRANSFORMING IRRIGATION MANAGEMENT IN NIGERIA (TRIMING) PROJECT. Siap+Micros has realized a real-time system for monitoring the turbidity in the water caused by the dredging operations of about 60,000 cubic meters from the seabed of the Monfalcone’s Port (North Adriatic Sea). The system is composed of three measurement points equipped with data acquisition and processing devices connected to high-precision turbidity sensors and to real-time data transmission devices. The whole system is designed to operate in marine environments. The system provided includes software PolarisWEB. It is a customized product for supervisioning remotely the monitored sites and for managing the alarms connected to the turbidity thresholds. The system implemented is aimed to regulate the dredging operations in the port observing the legal limits about the turbidity in marine waters and reducing the environmental impacts produced by the dredges. Here the video made by the Italian Television News realized for the presentation of the dredging activities started at the port of Monfalcone. Siap+Micros will be present at the most important show in Asia in the Meteorology and Hydrology field: inteMET Asia and interFLOOD Asia. We look forward to seeing you at booth A20 for exhibiting our projects & products and discuss about future developments. For more information, visit the events website: InterMET Asia & InterFLOOD Asia. SIAP+MICROS is pleased to announce the signing of the contract with Direction of National Meteorology of Ministry of Transportation (Direction De La Meteorologie Nationale – Ministere Des Transports) of the Republic of the Niger. The Government of the Republic of Niger received a grant from the Climate Investment Fund (CIF) administered by the African Development Bank (ADB) to cover the cost of the Climate Information and Prospective Development Project (PDIPC) and intends to allocate a portion of the proceeds of this donation to market related payments for the acquisition of equipment for meteorological stations. • A system of collection, processing and archiving of data that includes two servers (normal / backup). The project includes also training in installation, use, configuration and diagnostic processes of automatic weather stations. SIAP+MICROS together with the partner will provide the necessary technical support also in the supervision of the installation process to ensure maximum autonomy in the use of the equipment provided to the client. Our company is confident that this project will be the beginning of a long-term and fruitful cooperation with the Ministry of Transport and with the Government of the Republic of the Niger. 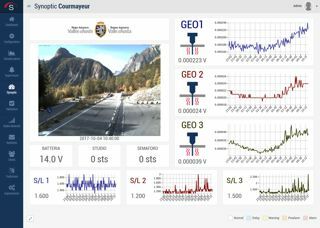 Siap+Micros in collaboration with IRPI CNR (Italian Research Council), has recently installed the ALMOND-F alarm and monitoring system in Courmayeur, Valle d’Aosta (Italy) on behalf of the Public Works Department of the Valle d’Aosta Autonomous Region. The system in question is aimed at the monitoring of debris-flows, an increasingly common phenomenon in recent times. The solution proposed and developed by Siap+Micros is a state-of-the-art system for monitoring these types of phenomena, as it can be best adapted to any type of site due to its flexibility of configuration. The system automatically activates two traffic lights in order to block incoming traffic. It is also possible to monitor in real time the data captured by the station and the status of the installation site, using a webcam and the Polaris Web monitoring software. Siap+Micros will be present, such each year, at the WORLD METEOROLOGICAL EXPO: the most important exposure of the meteorology industry worldwide. The event will take place in Amsterdam Netherlands, on 10th 11th and 12th of October at Hall 8 Amsterdam RAI and it will be an important showcase where there will be all the major manufacture companies in the meteorology field. We will be waiting for you at stand 5075 where we will show you our projects and products and where we will discuss future developments. For more information, visit the website of the Meteorological Technologies World Expo 2017. The installation of the equipment supplied for the project “Supply of Hydrometric equipment, including accessories and installation under Categories I, II, III & IV, and supply of other equipment, Base Station and software for Uganda” have just started. The project is funded by the World Bank in favour of the Ministry of Water and Environment of the Democratic Republic of Uganda. The project provides the supply, installation and maintenance of 16 Automated Surface Water Level Stations, 17 Automated Ground Water Level Stations, 4 Automated Full Climate Stations, 4 Automated Rain Gauge Stations and 1 Data Collection Centre equipped with a satellite dish for EUMETSAT data collection, Polaris Web monitoring software and Alfeo CMMS maintenance software. SIAP+MICROS is really proud to offer its technologies and professionality for the monitoring of the magnificent environment that characterizes the Pearl of Africa. The first automatic weather station of SIAP+MICROS was opened in Nukus, Uzbekistan, on 14th of April as part of UNDP’s collaboration with the Centre of Hydrometeorological Service under the Cabinet of Ministers of the Republic of Uzbekistan for “Developing climate resilience of farming communities in the drought prone parts of Uzbekistan” project in the Republic of Karakalpakstan with financial support of the Adaptation Fund. 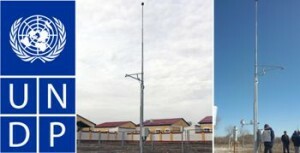 The project provides the modernization of 10 meteorological stations and 2 hydrological posts in 5 pilot regions of Karakalpakstan focusing on introduction of climate change adaptation measures, increasing the resilience of farming communities and farms. The sensors of each station measure temperature and relative humidity of air, pressure, wind speed and direction, snow depth, solid and liquid precipitation, and allow to measure also soil temperature. It is an honor for our company to be part of this project. This project has become an important stage in the expansion of the presence of SIAP+MICROS’s meteorological and hydrological stations in the CIS countries.